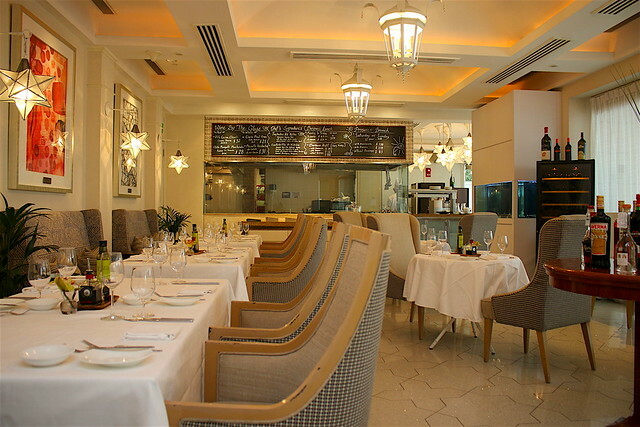 LaBrezza at St Regis is where we like to go for lunch sometimes, myself and a group of buddies. LaBrezza’s Chef de Cuisine, Luca Moioli, joined them a few months ago and came up with new twists on classic dishes with seasonal ingredients and produce from Italy. 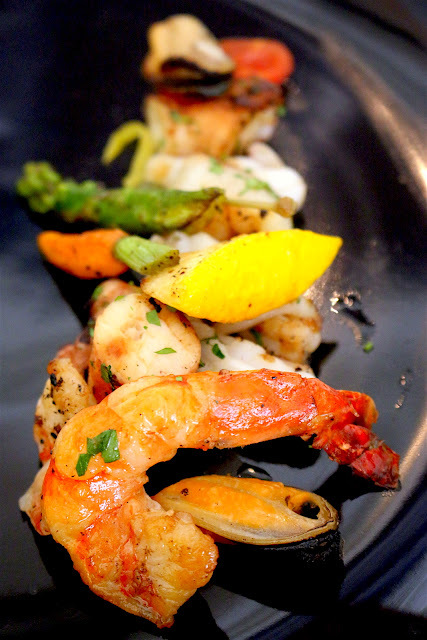 The handcrafted menus for lunch include antipastis like Insalata di Mare (above), a picturesque spread of grilled prawns, octopus, scallops, mussels, clams and calamari salad. The soups here warm both the heart and belly. 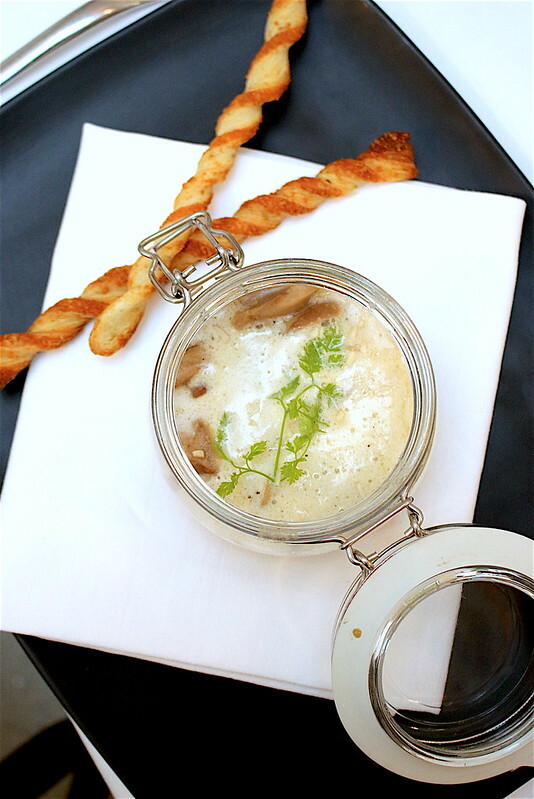 Zuppa di Porcini e Pollo is a beautifully earthy chicken and mushroom velouté served in a jar, topped with mushrooms espuma and hazelnut powder. Enjoy it with crisp cheese breadsticks. The pastas here are generally decent. We tried the Ravioli Del Plin. 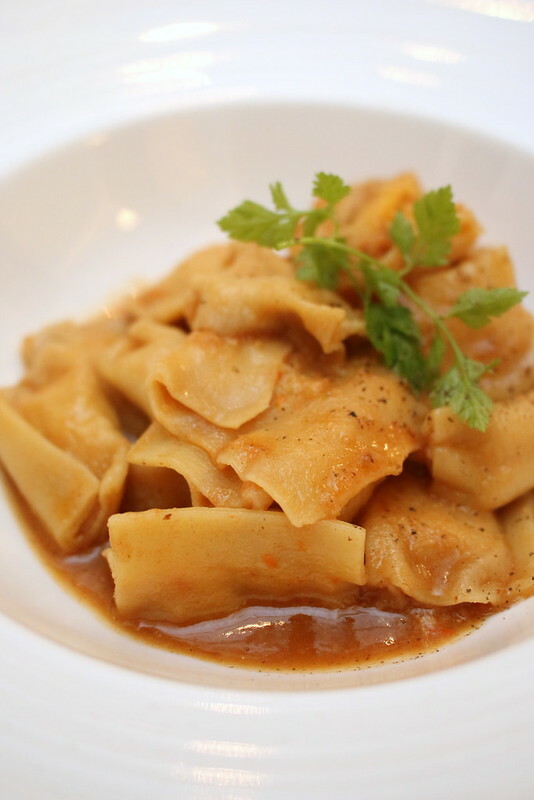 The traditional Piemontese Agnolotti is filled with chicken, pork and veal, all sweet and tender. The braising sauce is very light and makes this dish easy to eat. Now the risottos here are excellent. I previously had one here that was so good, I totally threw my low-carb diet out the window. 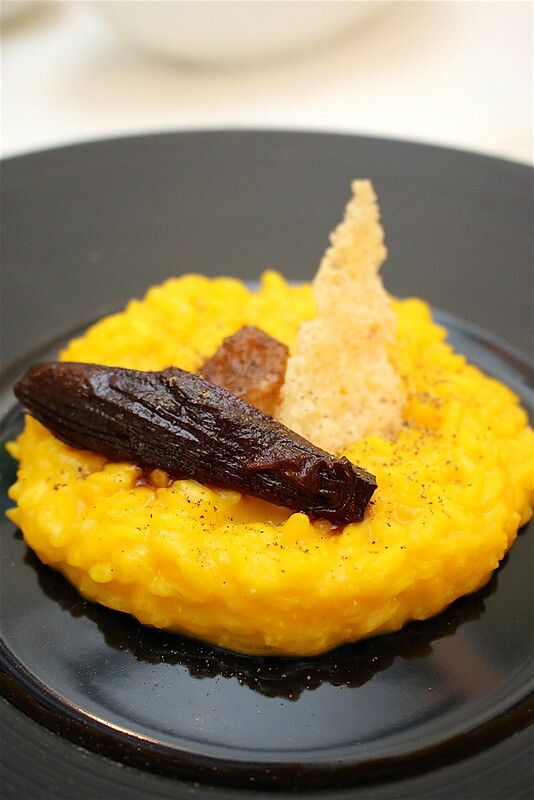 This time we got to try Chef’s Luca's saffron-infused creamy Risotto alla Milanese that's not on the regular menu. This traditional creamy rice is sunny saffron yellow and served with sweetly roasted bone marrow. For mains, we had a fish and a red meat dish. 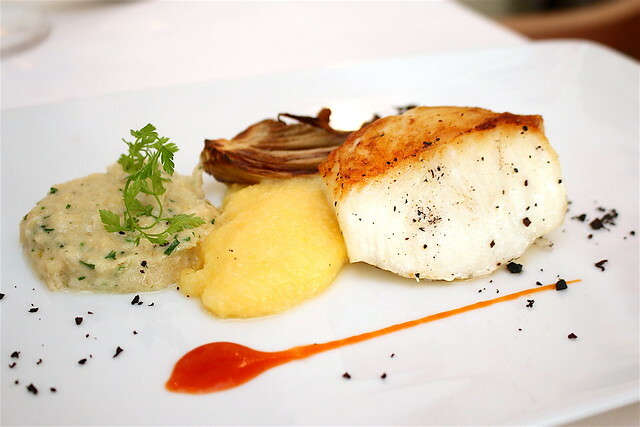 The Baccalá in due maniere consists of cod fish done two ways: oven-stewed cod fish (left) with braised onions and milk reduction; and pan-seared cod fillet (right) with organic polenta and charcoal radicchio. I like my cod pan-seared. 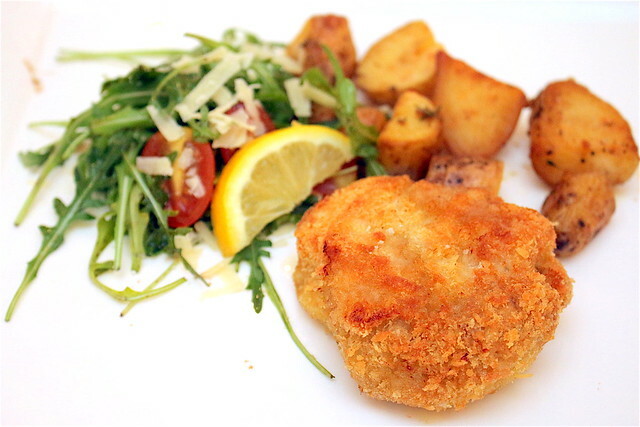 Costoletta di Vitello will please folks who like things deep-fried and golden brown. A thick piece of breaded veal chop (almost half a kg at 450g) dwarfs the buttered kipfler potatoes and rocket salad. This alone is very filling. 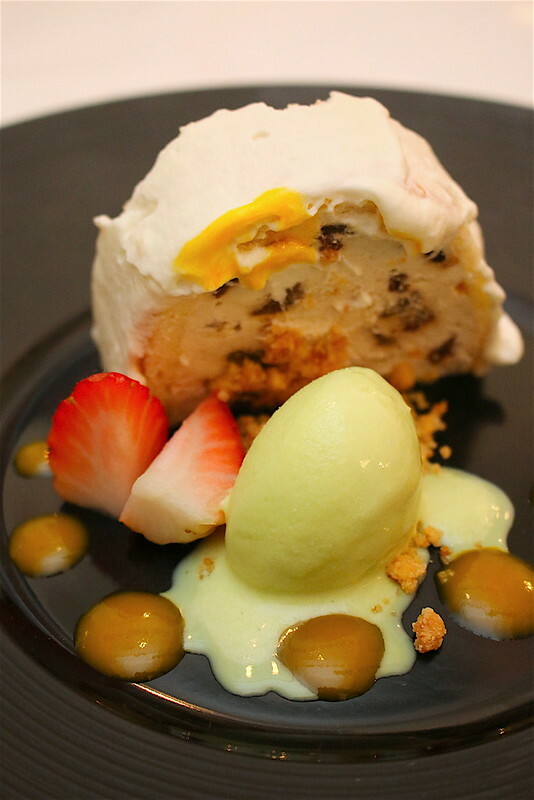 You can end the meal with a Sicilian Cassata which comes with ricotta cheese, candied fruit terrine with citrus coulis and pistacchio gelato. Much like eating ice cream cake. LaBrezza is small and cosy with comfy chairs that make you feel like lingering just a while longer. The fact that it faces the pool also makes it a relaxing place to be (LaBrezza means "the breeze" in Italian). course (S$43++) or 4-course (S$53++), has menus refreshed every quarter. On Friday evenings, the Barbecue Night (SGD88++) brings char-grilled seafood indulgences and exquisite meat selection, complete with roasted vegetables and homemade salsas. seafood, as well as passed-around pizza slices and delectable desserts.